Doomsday-thinking doesn't get us any step closer to counteracting climate change. “So... is the world going to end?”. This may not be the most common response when you tell someone what kind of work you do, but as a climate scientist I’ve gotten used to this question. Climate change often evokes doom scenario’s and it’s therefore understandable that people are very concerned: 2015 will most probably become the hottest year ever recorded, California experiences its worst drought in a thousand years, a third of Arctic sea ice has disappeared since the 1990s, and meanwhile glaciers continue to melt and sea level rises. It seems inevitable that these changes will have a worldwide impact on people’s lives, and in that context it’s difficult to keep an optimistic view towards the future. The question whether we’re headed towards an Apocalypse appears to be an obvious one. The Arctic in particular is a source of doom scenario’s: the discovery of mysterious craters in the Siberian permafrost and methane bubbles rising up from the bottom of the Arctic Ocean paint an image of an uncontrollable and catastrophic system. It is therefore essential that we improve our understanding of the consequences of climate change on the Arctic. In my own research I do so by studying how climate change leads to the release of CO2 and methane – the two most important greenhouse gases – from permafrost soils. Permafrost is common throughout the North Pole region and defined as soil that stays frozen for two consecutive years. Only the top part thaws during the brief summer. But while the North Pole warms as a result of human action, soils start to thaw deeper and deeper. Microorganisms can convert the carbon in this deeper thawed soil into the greenhouse gases CO2 and methane, which eventually will end up in the atmosphere. This way, a downward spiral starts that can’t be stopped: we cause climate change by emitting greenhouse gases, which leads to permafrost thaw, which leads to even more greenhouse gases etc. It’s not straightforward to determine the seriousness of this problem. The Arctic is large and we can’t measure everything and everywhere. But while we’re learning more about this region, a less apocalyptic narrative is emerging. Yes: The Arctic is a source of methane, and yes: we expect an increase following climate change. But this is not a fast process per se. The latest review on this topic as published in the scientific journal Nature earlier this year foresees that changes will occur gradually, and that, in the foreseeable future, greenhouse gas emissions from the Arctic will not become larger than what we ourselves emit from fossil fuels. On the contrary: our fossil fuel emissions are already six to eight times larger than the most probable future scenario for emissions from permafrost. This can be interpreted in two ways: emissions from permafrost will not be the end of us, we are doing that ourselves. But more importantly: this means that we can do something about it! Simply put, we need to reduce our emissions even further to compensate for the release from permafrost. Bottomless pit? 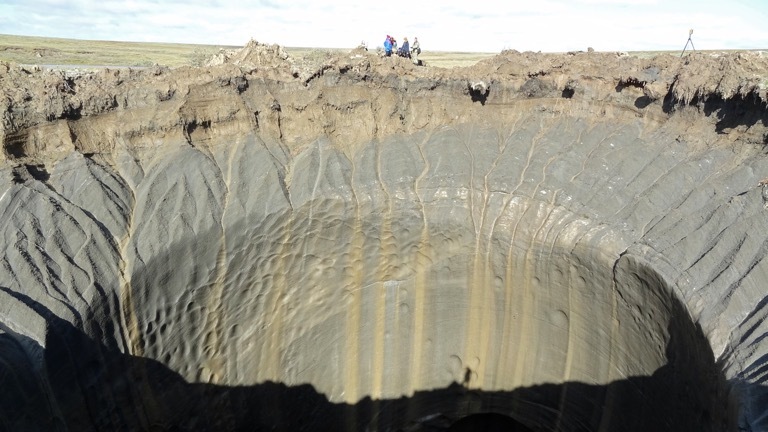 This crater in Siberia can give the impression that the world is coming to an end. But there are many shimmers of light in the fight against climate change. Still: while there are few countries in the world whose governments deny climate change, the will to truly act is often lacking. The Arctic Council decided last April to reduce methane emissions from these eight circumpolar countries, but specific emission reductions were not stipulated. Also, the emission reductions proposed so far in the run-up to the COP21 climate conference in Paris this December are not enough to keep global warming below the internationally agreed upon limit of 2 degrees Celsius. If we want to reach that goal, also to reduce the risk of high greenhouse gas emissions from permafrost, more rigorous measures need to be taken. Besides, it’s evident that the consequences of climate change will not be spread equally throughout the world. Countries such as Bangladesh do not have the resources to build dikes everywhere like the Dutch have done over the past centuries. With climate change it will be people with the lowest income and in countries with the least functional governments that will suffer the most. Meanwhile, the top 20 of countries best prepared for the consequences of climate change consists exclusively of rich industrialised nations that are responsible for most historical fossil fuel emissions. This inequality evokes a moral responsibility to tackle the problem of climate change seriously, and to stop further lingering. As Obama said in September: “We are the first generation to feel the effect of climate change and the last generation who can do something about it”. It is therefore important to remember that change is finally happening. Globally, the fossil fuel divestment movement is making vast strides, urging governments and companies to keep fossil fuels in the ground. And not without result. Norway’s Government Pension Fund, which holds one percent of global equity markets, recently decided to divest from the coal and tar sand industries. Due to the large size of this fund its movements are tracked by investors globally, and acts as an example. More remarkably, the six largest energy companies of Europe, including BP and Shell, publicly called for a price on carbon earlier this year. Meanwhile, there’s a revolution going on in the solar and wind industry, and after decades of promises electric cars are finally becoming commonplace in our streets. These are all indications that change is possible. Concern about climate change is warranted, but stories in the media about doom scenarios that humanity can’t control only lead to apathy and a dismissal of responsibility. A better message is therefore: it’s not too late, but don’t wait any longer.